The 88-year-old acting legend introduces the world to her namesake hot dog. Naked wieners, buns and Betty White. Some days, the jokes write themselves. Monday was one such day, as the 88-year-old acting legend helped open the new Pink's location at Universal CityWalk. "I have loved Pink's hot dogs forever and ever, so when they said they were going to..." said a playful White as she got her hands on the hot dog. "Well that's obscene." "When they said they were going to name one after me, I said, 'But how can you, cause I don't use anything on it … the weenie is so good, I have the weenie and the bun.' So they said, 'Well, it's a naked hot dog,' and I wish they had never thought of that," she said. Pink's honors the 88-year-old actress with her own hot dog. 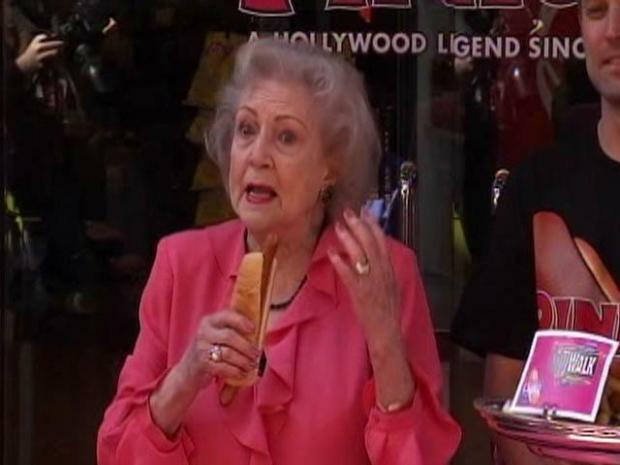 After a few bites of the "the Betty White 'Naked' Hot Dog," the actress made things official. "I can now say, I believe, that the new Pink's is open. Come and enjoy," said White just before she cut a "grand opening" ribbon. White, who is perhaps best known for her work on "The Mary Tyler Moore Show" and "The Golden Girls," is scheduled to appear on "Saturday Night Live" on May 8.